View this presentation for additional information. The Public Art Committee shall endeavor to develop a collection of public art that is of the highest quality, that will encompass a broad aesthetic range reflecting the city and the minds of its citizens, that will improve the quality of life in the area, that will be accessible to all individuals, and be a source of pride to all residents. The Public Art Committee shall seek to develop the Percent for Art Program and the associated collections in such a way so that it is intimately integrated into the fabric of the City of Missoula and reflects a broad range of community input and involvement by artists and art professionals. 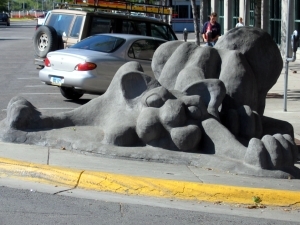 The Public Art Committee is responsible for reviewing, advocating, and developing public art projects in the public domain for the City of Missoula. It will develop a formal structure in which to create, develop, and maintain public art as well as further public accessibility to the arts. The Public Art Committee consists of nine members serving four-year terms. Members shall be selected because of their expertise in historic preservation, visual arts, architecture, or affiliation with a local business association or public entity. Six members will be appointed by the mayor and confirmed by the City Council, two members will be appointed by the City Council and one member shall be a member of the Missoula City Council. If you have questions about public art or the Public Art Committee please contact Heidi Bakula in the Mayor's Office at (406) 552-6001.